Now that you know how to inspect and pre-process an event log, we proceed with showing how to answer the questions related to the discovery plug-ins. Recall that a log is the only input for these kinds of plug-ins. The questions answered in this Section are summarized in the table below. The first section shows how to mine the control-flow perspective of process models. The second matrix explains how to mine information regarding certain aspects of cases. The third section describes how to mine information related to the roles/employees in the event log. The control-flow perspective of a process establishes the dependencies among its tasks. Which tasks precede which other ones? Are there concurrent tasks? Are there loops? In short, what is the process model that summarizes the ow followed by most/all cases in the log? This information is important because it gives you feedback about how cases are actually being executed in the organization. Open the filtered log that contains only the completed cases, or redo the filtering for the original log of the running example. Verify with the analysis plug-in Log Summary if the log is correctly filtered. If so, this log should contain 1000 process instances, 12 event classes, 1 start event (“Register+complete”), 1 end event (“Archive Repair+complete”), and 13 originators. 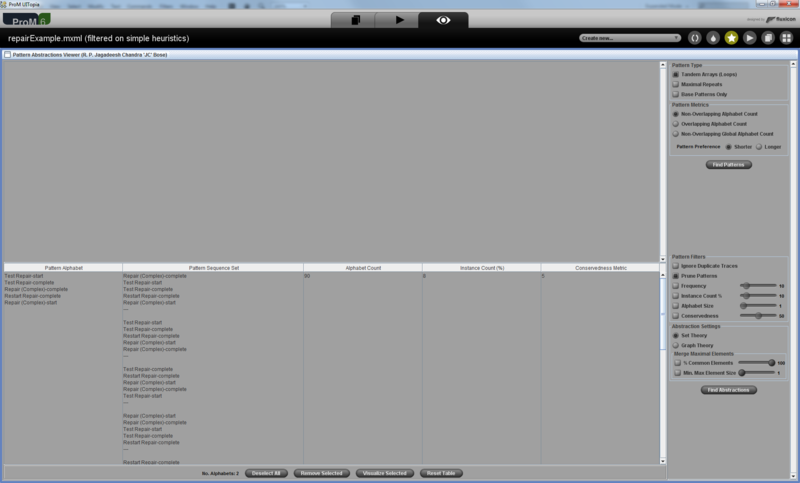 Select the filtered log in the workspace view. Select the “Action” button. 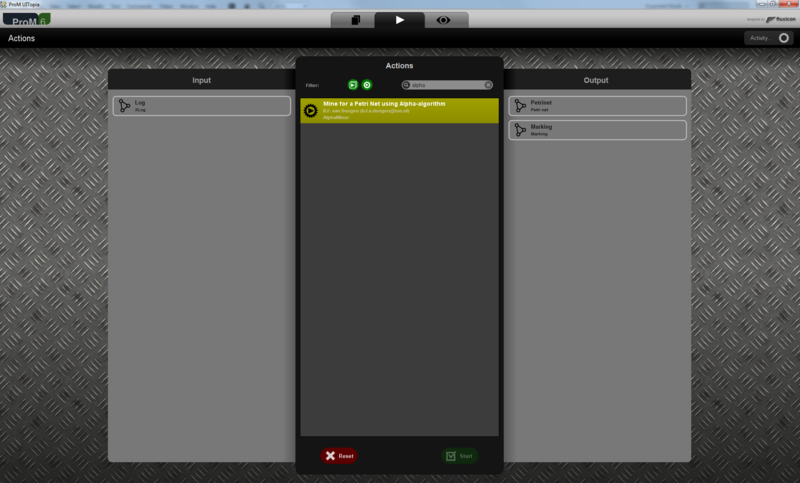 This will open the action view with the filtered log selected as input. Select the “Mine for a Petri Net using Alpha-algorithm” plug-in. All cases start with the task “Register” and end with the task “Archive Repair”. This is not really surprising since we have filtered the cases in the log. the actual fix of the defect can be started by executing the task Repair (Complete) or Repair (Simple). The model has a loop construct involving the repair tasks. Based on these remarks, we can conclude that the cases in our running example log have indeed been executed as described. As a final note, although in this section we mine the log using the “Mine for a Petri Net using Alpha-algorithm” plug-in, we strongly recommend you to try other plug-ins as well. The main reason is that the “Mine for a Petri Net using Alpha-algorithm” plug-in is not robust to logs that contain noisy data (like real-life logs typically do). Thus, we suggest you have a look at the help of the other plug-ins before choosing for a specific one. In our case, we can hint that we have had good experience while using the mining plug-ins “Flexible Heuristics Miner”, “Inductive Miner”, and “Fuzzy Miner” to real-life logs. What are the most frequent paths in the process? Are there any loop patterns in the process? What is the distribution of all cases over the different paths through the process? Can I select a subset of traces where particular paths were executed? Can I simplify the log by abstracting the most frequent paths? Select the “Visualizer” button. 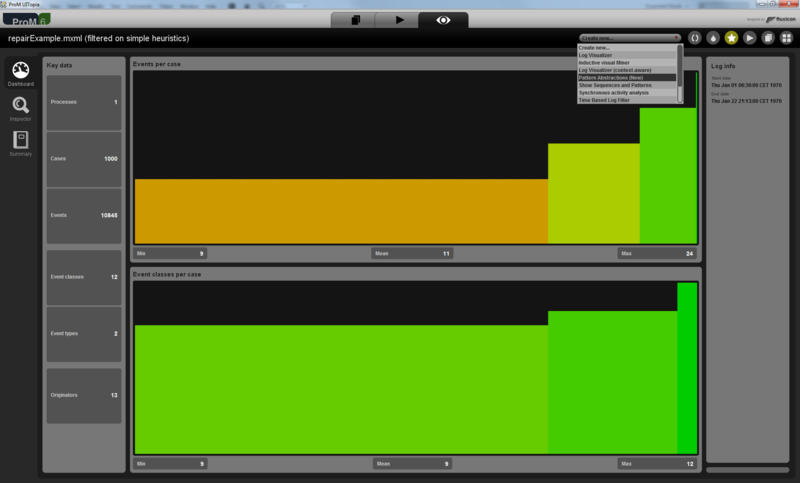 By default, you will notice the “Log summary” visualizer. 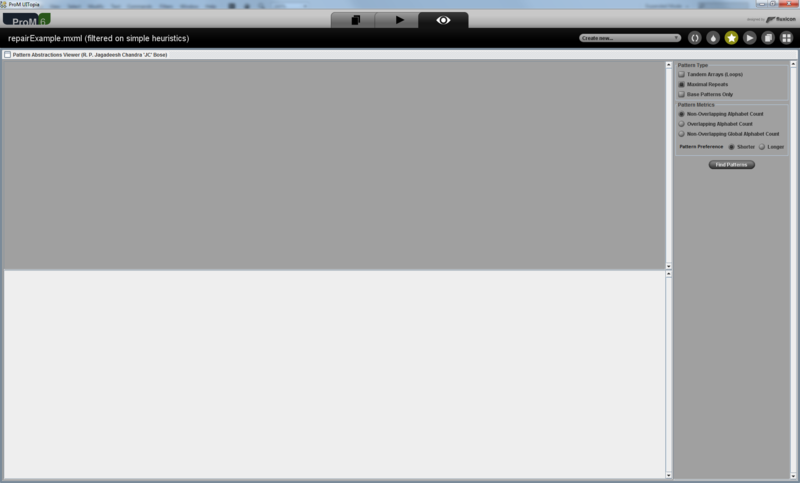 Change the visualizer to “Pattern Abstractions (New)” as shown in below. You should get a screen like the one below. Choose the “Tandem Arrays (Loops)” and click “Find Patterns”. In order to find frequent paths not involving loops, choose “(Maximal) Repeat Patterns”. You should get a screen like the one in below. You can observe that the activity Restart Repair is involved in two loop patterns, one with “Repair (Simple)” and the other with “Repair (Complex)” procedures in conjunction with “Test Repair”. The value in the instance count (%) column gives the distribution of a particular pattern. For example, you can notice that in 21% of the cases, the Restart Repair is required following a “Repair (Simple)” procedure and in 8% of the cases where “Repair (Complex)” procedure was performed, a Restart Repair was required. This also implies that in 71% of the cases, the defects could be fixed in the first attempt. Click “Find Abstractions” Button. You should get a screen like the one below. In the top left panel, select the check box against the pattern (path) of your interest. In this case, against “Repair (Complex)”, “Test Repair” and “ Restart Repair”. Click “Export Selected (Log)” button. An event log containing only the cases where this particular path is executed will be pushed onto the workspace. You should be able to see the log with the name “Selected Abstraction Log”. 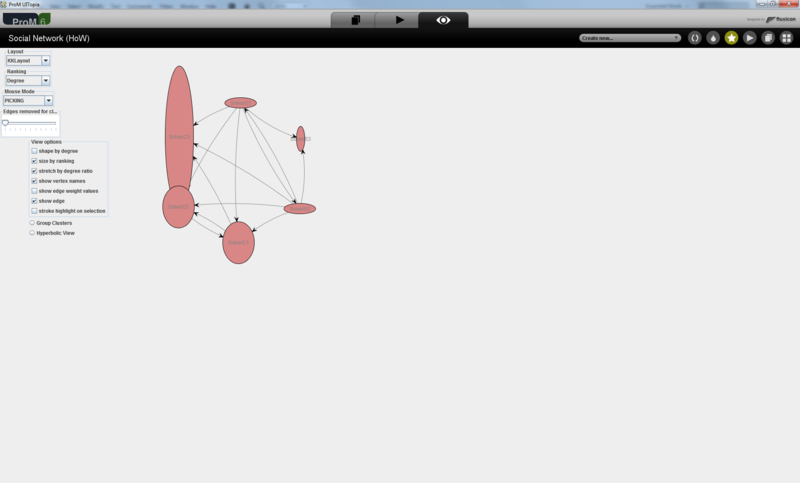 You can also use this visualizer to abstract frequent paths. In order to do this, define meaningful names for the patterns in the top left panel obtained after clicking “Find Abstractions”. Then click “Transform Log” button. This also creates sub-logs that capture the manifestation of the frequent paths. 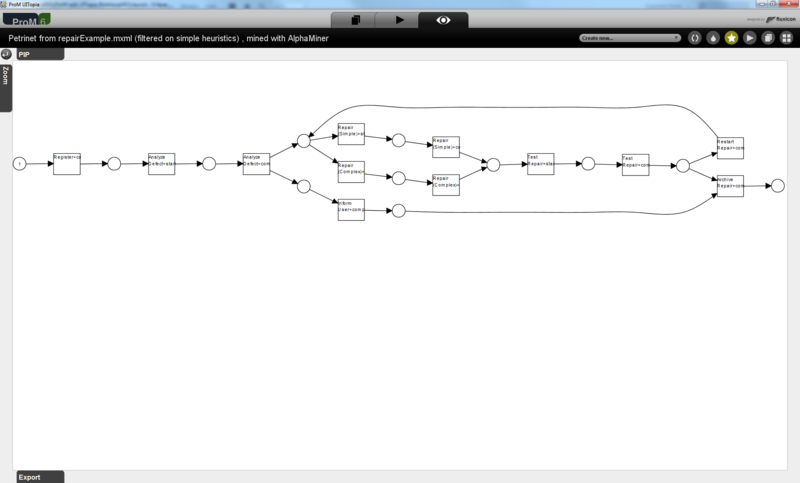 The fuzzy miner plug-in can make use of these abstractions to mine hierarchical process models. You can iterate over this transformation process to any number of steps thereby simplifying the log to a desired granularity. Take your time to have a look at the other options provided by this visualizer. For instance, by configuring the Filter options you can select specific mined patterns etc. How many people are involved in a specific case? Who subcontracts work to whom? These and other related questions can be answered by using the Social Network Miner plug-ins. In the following we explain how to answer each question in the context of our running example. Open the filtered log for the running example. In the “Instances” pane, locate the instance with ID 120, and select it. Open the log for the running example. Use the "Filter Log using Simple Heuristics" plug-in to filter the log so that only the task “Repair (Simple)+start”, “Repair (Simple)+complete”, “Repair (Complex)+start” and “Repair (Complex)+complete” are kept. (Hint: Use the Log Summary to check if the log is correctly filtered!). Select the “Action” button. 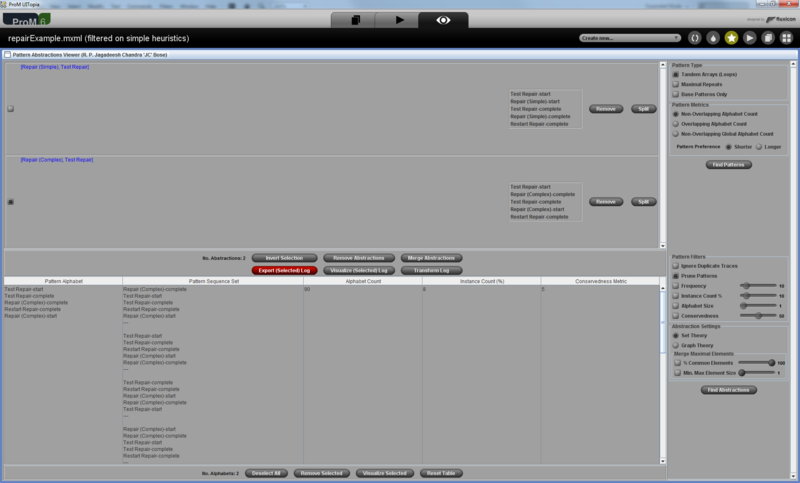 This opens the action view with the filtered log selected as input. Select the “Mine for a Handover-of-Work Social Network plug-in. Keep the default settings and select “Continue”. Select the options “size by ranking”, “stretch by degree ratio”, and set Mouse Mode to “Picking” (so you can use the mouse to re-arrange the nodes in the graph). You should get a result like the one in the figure below. The resulting graph shows which employees handed over work to other employees in the process instances of our running example. By looking at this graph, we can see that the employees with roles “SolverS3” (top-right node) and “SolverC3” (top-left node) outperform the other employees because the telephones these two employees fix always pass the test checks and, therefore, are not re-sent to the Repair Department (since no other employee has to work on the cases involving “SolverS3” and “SolverC3”). The oval shape of the nodes in the graph visually expresses the relation between the in and out degree of the connections (arrows) between these nodes. A higher proportion of ingoing arcs lead to more vertical oval shapes while higher proportions of outgoing arcs produce more horizontal oval shapes. From this remark, can you tell which employee has more problems to fix the defects? Take you time to experiment with the plug-ins explained in the procedure above. Can you now answer the other remaining questions?